The Elvet Methodist Church Prayer Group has continued to meet each alternate Monday at 2pm for an hour of discussion, prayer and meditation throughout the year. We have only a small number of members, considering the church membership, but we have the privilege of bringing before the Lord, not only the life and worship and witness of Elvet Methodist Church, but also the individual needs of those people who are ill, bereaved or passing through times of testing and trial, as well as being thankful for those blessings which our church and people have shared. Looking ahead, we hope there will be some who, on reading this, will join us in this important part of the church’s life; it takes place on the second and fourth Monday of each month, from 2:00 - 3:00 p.m. from September to July. You will be most welcome. 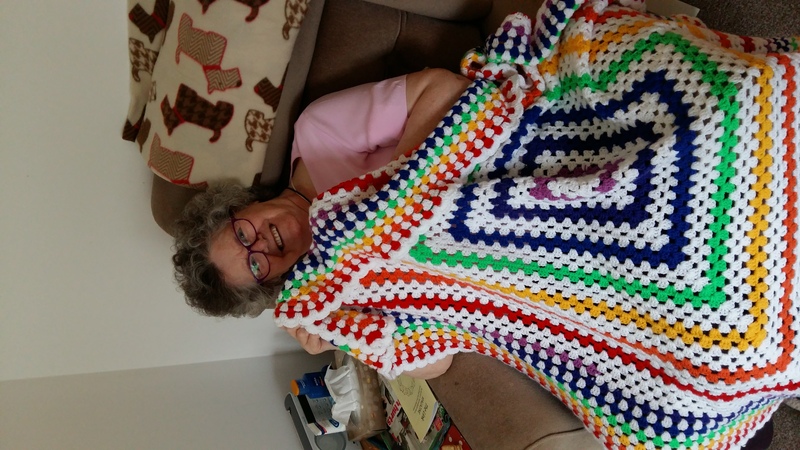 Elvet members are producing prayer shawls, which are lovingly and prayerfully made for each individual who receives them. They are then presented to our friends, so they have a permanent reminder that they are being prayed for by their friends at Elvet. There are others on the list to receive them as more are made. One of them has been has been delivered to Alma Gooch. Her granddaughter, Naomi Woodfield visited her recently, and it was the first thing Alma mentioned when she walked through the door! 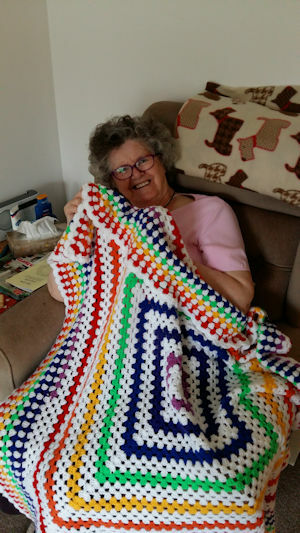 She loved the colours! The photo shows her grinning from ear to ear! For further information contact Jeannette Bygate. Elvet’s Prayer Tree is placed in our side entrance area so that anyone entering by our side door may be able to pass by and if they wish stop and write a prayer and hang it on the tree and then go on their way to their chosen activity. Every Sunday this Prayer Tree is taken into the church and all the prayers on it are encompassed in the prayers during the service. Please add your prayers, requests or answered prayers, however short or long to this tree. Also at its fortnightly meeting Elvet’s prayer group includes these prayers during their prayer time. Our Tuesday morning group meets fortnightly in the Framwellgate Moor area, from 10.15am - 12 noon. It currently consists of 11 women, though the lack of gender balance is not deliberate! The meetings begin with a short period of worship, which is followed by a discussion. In January 2015 we started studying John's Gospel, which is quite different from the other three. Our guide is William Barclay, whose book gives us lots of background information, making the study both interesting and enjoyable. We greatly value the input of every individual member - although just listening is fine - and we love the fellowship we share. New members will be warmly welcomed. Contact us here. This group has met in Brancepeth Close, Newton Hall, for over sixteen years. The membership has seen many changes over this time as we have welcomed new faces from many different places. For the past year it has been clear that the group was becoming too large to meet comfortably in onehouse and reluctantly it was decided that we should form two groups. Thus, some of us (the more adventurous, perhaps) agreed to hold their meetings at West Grange Farm, Shincliffe (see below). 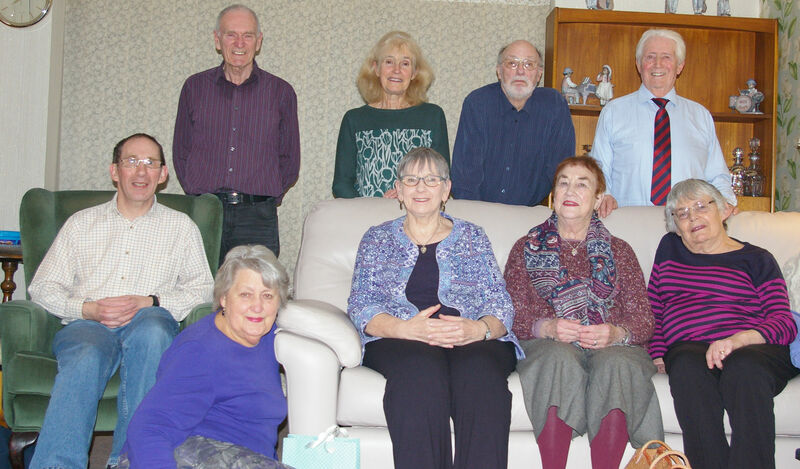 The 'new' Brancepeth Close group met on February 2nd, 2015 to work out a programme of study. It was agreed that for our first 5 or 6 meetings (fortnightly from 14th February) we would follow the York Course "PRAISE HIM - Songs of Praise in The New Testament". Following that we plan to discuss issues raised in Judith Hirst's book " A Kind of Sleepwalking" . Future meetings will look at Tom Wright's thoughts in his book "Finding God in the Psalms", and we also hope to use John's Gospel (part of) for a 'Bible Study'. All our meetings begin with a short prayer and end with The Grace, said to each other. Refreshments follow. We value our friendship and support for each other and extend a warm welcome to those who wish to join us - hopefully it will not take 16 years before we need to divide again! For more information please contact Chris Webb. Sometimes we might follow a more traditional Bible study such as one on the book of Hebrews we did last year, but we have also used books by Rev David Wilkinson (When I Pray What Does God Do?) and Rev Judy Hirst (A Kind of Sleepwalking) to read and discuss. We then moved on to study Steve Mann's Will You Join our Crusade? The invitation of the Gospels unlocked by the inspiration of Les Miserables. This includes film clips as well as extracts from the book and related Bible passages. We are currently going through Pope Francis' encyclical, 'Laudato Si' which translates into English as “Praise Be Unto You”. Taster: In the words of this beautiful canticle, Saint Francis of Assisi reminds us that our common home is like a sister with whom we share our life and a beautiful mother who opens her arms to embrace us. “Praise be to you, my Lord, through our Sister, Mother Earth, who sustains and governs us, and who produces various fruit with coloured flowers and herbs”. We value our friendship and support for each other and extend a warm welcome to those who wish to join us. Ideas for new study subjects are always welcomed. For more information please contact Penny Bissell.